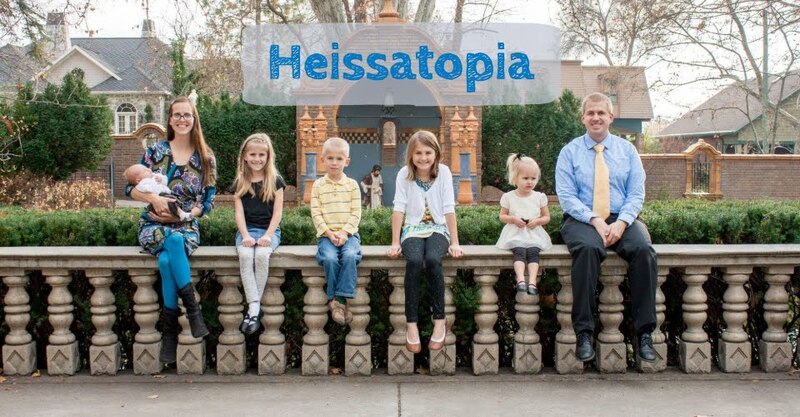 Heissatopia: Other kids. We have them. It's been a week and a half since Benjamin was born and our whole world was turned upside down. We were not prepared for this at all; things didn't happen according to our lovely little plan (like being born around his due date instead of...not). The best laid schemes of mice and men...am I right? Well, our girls have been just as stressed out as we've been. Their sleep schedules have been thrown for a loop. They've had different people putting them to bed at night and different people taking care of them during the day and they've never spent as much time away from Mommy in their whole lives as they've spent this week. There has been an influx in tantrums, which is unfortunate because I do not have nerves enough to deal with tantrums right now. Today, for example, Miriam woke up at 6:30, demanding breakfast. She went to bed around 9:30 last night and who knows when she actually fell asleep. I tried to get her to go back to sleep but she was wide awake, so I got up and had breakfast with her and pumped for Benjamin. Then when Daddy and Rachel got up to get ready for the day I did the girls' hair and then went back to bed for a nap. They went to swimming lessons with Grandpa, came home and had lunch, and then went to play at the Valentine's house while Andrew and I went to the hospital. We picked them up on our way home and while Andrew and Rachel were making dinner, I held an exhausted little Miriam on my lap. "You are so tired!" I told her. "I am not!" she insisted. But five minutes later she was completely zonked. She slept until dinner. Then we ate and played and coloured and read stories and got in our jammies and went to bed. The girls are both asleep now and it's not even 9:00 yet (miracle of miracles). Interestingly enough, this isn't the first morning this month that Miriam's decided that the crack of dawn is a good time to wake up. On the morning we left to have baby Benjamin, we fled the house without waking anyone. There wasn't time to, really. We texted Karen when we got to the hospital, so she spent the rest of the morning drifting in and out of sleep, listening for sounds of children and phone calls. At around 5:00 in the morning she heard someone patter across the floor. It was Miriam waking up. She's usually so good about staying in bed but for some reason she felt that 5 AM was a perfectly logical time to get up on a Sunday morning. Grandma took her downstairs to cuddle in bed. At around 8 AM (which is a logical time to wake up) Grandma awoke to the sounds of Rachel screaming. Rachel had gotten out of bed and wandered into our bedroom to find me. But I wasn't in the bed and I wasn't in the shower so clearly something terrible had happened. She ran back to her bedroom, slammed the door, jumped into bed, and pulled the covers over her head and sobbed. That's how Grandma found her. Grandma told her that we'd just gone to the hospital to have baby Benjamin and that she didn't have to be scared—there were still plenty of places to look for Mommy (the kitchen, the living room, the office, downstairs...) and if she still hadn't been able to find Mommy then she could have looked for Grandma or Grandpa or Daddy. Apparently Rachel hadn't thought of any of that, but she was comforted (and overly excited) to learn that Benjamin was on his way. I think she was probably the only person in the entire world who was excited that Benjamin was about to be born. I, for one, was terrified. I think this is one of those times where ignorance is bliss because Rachel certainly had no idea what was in store for our family; she was simply excited that her brother was here. She's still excited, I think, though she does seem to resent all the time we spend at the hospital. We'll all get through this somehow, though, right? So crazy for all of you! I saw your mom at the park with the girls and it was fun to actually meet them and talk to them. They are so cute and sweet! I am praying for your whole family. Just adding a baby to the family is hard enough; dealing with all the extras a preemie brings must be awful! I wish you the very best. Hopefully Benjamin can come home soon and life can get somewhat normal again. Rough stuff! When Ezra was born my good friend had her first, a baby born at 29 weeks. I remember thinking it was super difficult and it really was, I'm not saying it wasn't, but I found that doing the whole preemie thing with kids at home, well it added a whole bunch more trauma. There is all this guilt and the kids have all this stress as well. Keeping you guys in my prayers!